"These recordings, made in 1963-4, showcase Fred McDowell in his prime. As recorded by Peter Welding, My Home Is in the Delta finds Fred and his wife basking in the blues and gospel. Unlike Amazing Grace, which was also originally released by Testament and reissued by Sutro Park, this album is barer, a little more raw and personal. As if Fred is in a room right next to you playing the blues with his slide style that set the pace for everyone who came after. 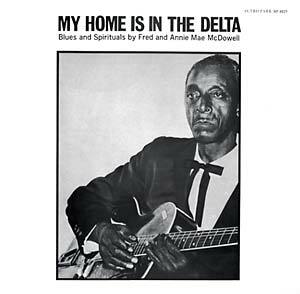 Fred McDowell is the king of the hill country blues, and My Home Is in the Delta is the crown. Includes classics such as 'Going Down South' and 'Waiting for My Baby.' A true treasure, remastered for this release by sound-mastermind Gary Hobish. Pressed on 180 gram vinyl with a beautiful tip-on jacket. Note: this is the original ultra-rare cover."